In part I, we have discussed the various deployment options of transportation management for retail companies. This part II of the blog is to discuss which of those options a retailer might choose. Of course, it is not possible to give a generic guidance on deployment options because there exist several assessment criteria and their pro/con impact for a specific deployment option. It has to be judged per individual implementation project. But you may use the following as a first entry for project discussions. 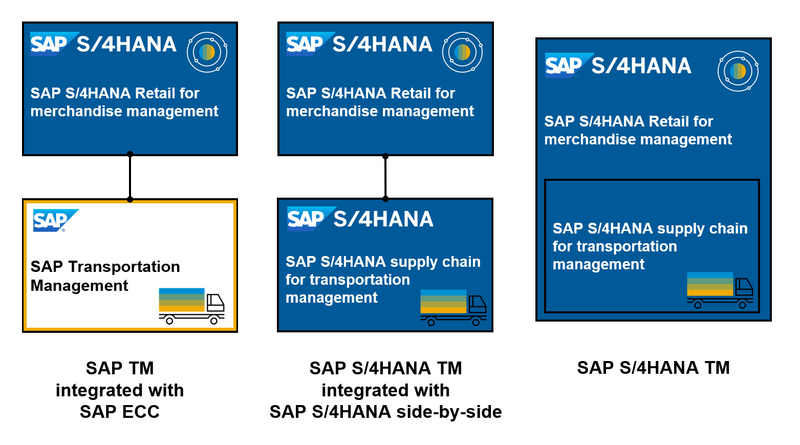 In principle, the retail customer can choose between the S/4HANA product SAP S/4HANA Supply Chain for transportation management (in the following called SAP S/4HANA TM) and the Business Suite product SAP Transportation Management (SAP TM). As SAP S/4HANA is the strategic product and SAP TM (Business Suite) runs out of mainstream maintenance in 2025, he should opt for SAP S/4HANA TM, if it is possible. Please check SAP Maintenance Strategy for further Information. Is it possible to go for the strategic product SAP S/4HANA TM or is it necessary to go for SAP Transportation Management (Business Suite)? In the following the aspect of carrier collaboration will be discussed exemplary. Does the retail company need the functionality of carrier collaboration? The SAP TM Collaboration Portal (Business Suite) manages interactions between a retailer and his carriers. It provides an easy but limited access for the carriers to the retailer’s SAP TM (Business Suite) system to collaborate regarding freight agreement management, freight tendering, exchange of freight orders, event notification & handling and finally freight settlement. The Collaboration Portal is currently only available within SAP TM (Business Suite). S/4HANA TM 1809 does currently not offer a collaboration portal. But S/4HANA TM supports some features of the SAP TM Collaboration Portal (Business Suite) via means of EDI or mail communication. The SAP TM (Business Suite) Collaboration Portal is planned to be replaced by SAP’s Logistics Business Network (SAP LBN), SAP’s new strategic solution for collaboration. SAP LBN is a cloud-based collaboration platform for logistics. SAP LBN’s initial scenario focus is planned to be freight collaboration for truck-based transports. A retailer without an own fleet, who contracts Logistics Service Providers (LSP’s) to manage transportation execution, might today go for SAP TM (Business Suite) integrated with SAP Merchandising for Retail to take advantage from SAP TM Collaboration Portal. 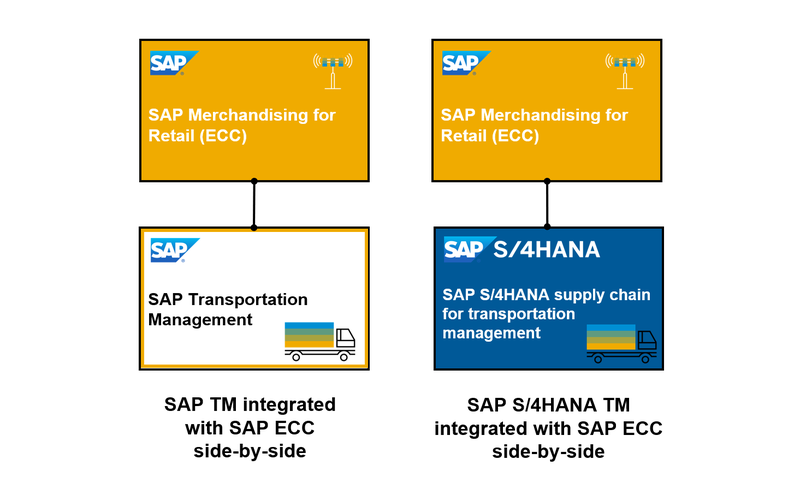 A retail company with a large own fleet and therefore minor carrier collaboration might be able to turn to SAP S/4HANA TM integrated with SAP Merchandising for Retail as a side-by-side deployment. Is it possible to go for the strategic product SAP S/4HANA TM or is it necessary to go for SAP Transportation Management (Business Suite)? Please follow the discussion under a) above. Is it possible to run SAP S/4HANA TM embedded in SAP S/4HANA Retail for merchandise management to take advantage from being in a single system or is it necessary to go for SAP S/4HANA TM integrated with SAP S/4HANA Retail for merchandise management in a side-by-side approach? If SAP TM (Business Suite) is already in place at the retail company, SAP TM can be integrated to SAP Merchandising for Retail and additionally, to SAP S/4HANA Retail for merchandise management. This might be interesting on a retailer’s journey to S/4HANA as it offers flexibility regarding the roll-out of a SAP S/4HANA solution. A retail company might also start its digital journey to S/4HANA with an SAP S/4HANA TM. 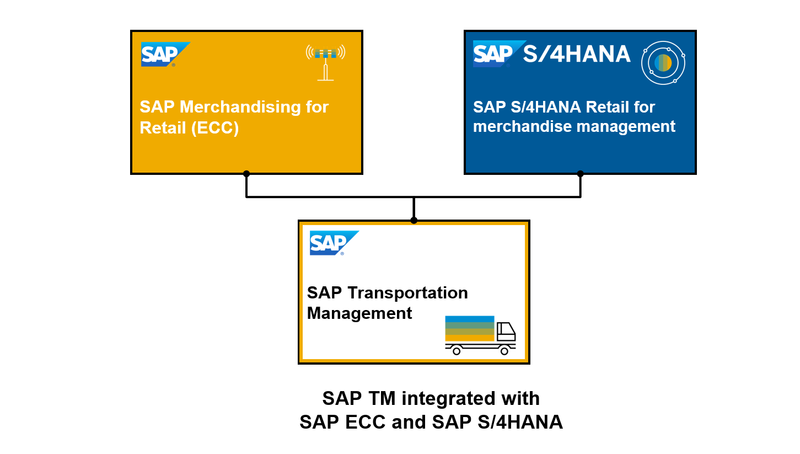 It might connect as a first step SAP S/4HANA TM to SAP Merchandising for Retail and take advantage of first experiences in the SAP S/4HANA world by using the transportation functionality offered by SAP S/4HANA TM. 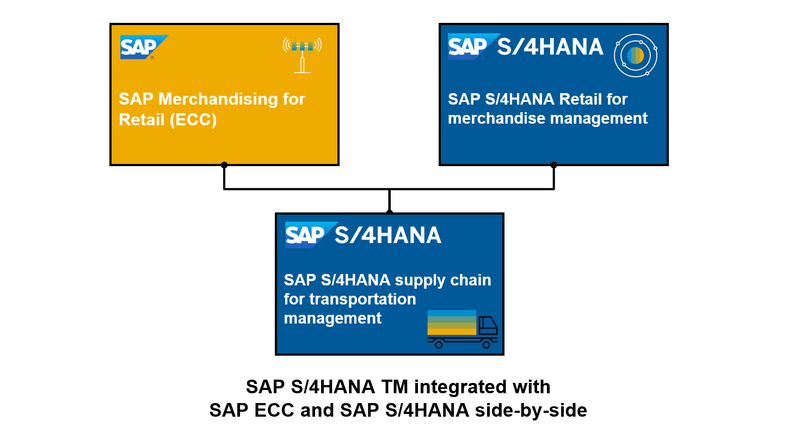 When this company is ready for the next step from SAP Merchandising for Retail to SAP S/4HANA Retail for merchandise management, a phased roll-out of SAP S/4HANA Retail for merchandise management is facilitated, as SAP S/4HANA TM can be connected to both ERP systems in a transition phase. Where have all the pallets gone? The blockchain knows! Watch out for further information on how SAP’s Digital Logistics and SAP Leonardo solutions are driving the retail supply chain!